After the recall on dog food less than two years ago, dog owners across the country scrambled to find natural dog food recipes they could make themselves. The situation spawned millions of inquiries across the 'net, and people turned to each other as vets eschewed the idea and dog food manufacturers scrambled to assure the public that their brands were safe. LoveToKnow's Two Minute Dog Advice guest columnist, Wendy Nan Rees, is an expert on creating natural food recipes for pets. She has been a driving force in the pet industry for 25 years and started her own business, LipSmackers, Inc., built on offering naturally made food and treats for pet owners. Wendy is author of The Natural Pet Food Cookbook: Healthful Recipes for Dogs and Cats. She has a wonderful, common sense approach to feeding your furry friends, but knows that they, like us, love variety. The recipes provided call for human grade foods, and they are easy to follow. They are also veterinarian approved. Cool, de-bone and chop the chicken in pieces suitable for your dog's mouth. Discard these bones. Chicken and other bones of fowl are brittle and sharp, even after cooking, and can injure your dog. According to package directions, prepare brown rice by boiling water and cooking for 20 minutes. Do not use prepared box brown rice as it is often loaded with salt. Add steamed vegetables such as green beans or squash. Carefully cut these up into bite size pieces. Add liquid dog vitamins (available at pet stores) in the recommended proportions on the label. Please note: Cook all meat before serving it to dogs. While there are many proponents of letting dogs eat raw meat, it is better to err on the side of caution unless you are sure of your dog's digestive system. The amount you should feed your dog depends on his size, age, weight and general health, so you'll need to consult your vet about how much food your dog should receive each day. You can also break that single serving into two servings if you want to feed your dog twice a day. Later you can sit down and calculate how much you saved by making this most basic of all dog meals. You can substitute liver, beef and even fish in the place of chicken. Life is often not worthwhile to human beings without periodic treats to vary our normal diet. The same is true of dogs. There are many recipes for homemade dog biscuits. Grease a cookie sheet and preheat the oven to 350°. Mix the flour, barley and wheat germ together, and then add the rest of the ingredients. Your goal is soft dough; you can add more flour if necessary. Roll in the shape of small logs, or teaspoon or tablespoon size balls (depending on the size of the dog). Press down with the back of a fork. Cool, and then put in an airtight container. You can add a little peanut butter to this recipe. Natural, organic peanut butter has the most nutritional value and contains less salt and sugar. You can also add grated cheddar cheese. 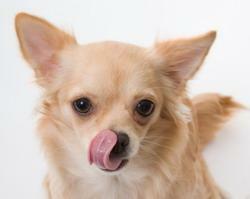 Natural dog food recipes should contain some fat and oil, but also be low in sugar. Whenever possible, substitute a little honey or molasses instead of processed sugar when you discover a dog food recipe you would like to try. Dogs can enjoy a cool treat just like humans on a hot day. Some dogs even like to crunch ice. This recipe is for them. Fill a small plastic bowl or gelatin mold with water or sugar-free gelatin. Add strawberries or a few diced carrots. Freeze until soft (not firm). Place in a bowl, and let your dog enjoy. Mix yogurt with an equal amount of whipped cream and one to two beaten (until peaks form) egg whites. If using unsweetened yogurt, you may add a tablespoon or two of honey. Pour into an ice tray, and freeze until slushy or firm. Remove and let your dog enjoy. Long before dog food companies existed, dogs would eat the same food as their owners. As long as you remember to keep it nutritious for your canine companion, there is no harm in making and serving them your own natural dog food.